Last Saturday in Raleigh was characteristic of a typical southern summer afternoon: hot and miserably humid. It was so uncomfortable that it forced me out of the graveyard. 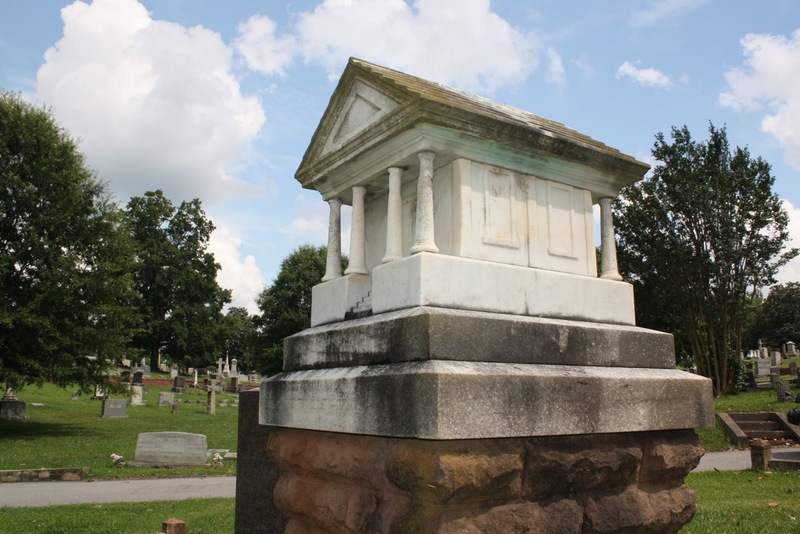 Just before leaving Oakwood Cemetery I spotted a monument down the hill from where I was taking pictures that looked different from all the others. The base was brick with what looked like a replica of a building on top, so we drove over to check it out. I’m really glad that I decided to investigate further because not only is this marker incredibly detailed, it comes with a stirring and tragic story of racism, a woman’s life cut short, and the downfall of a promising architect’s career, family and sanity which ended in suicide. 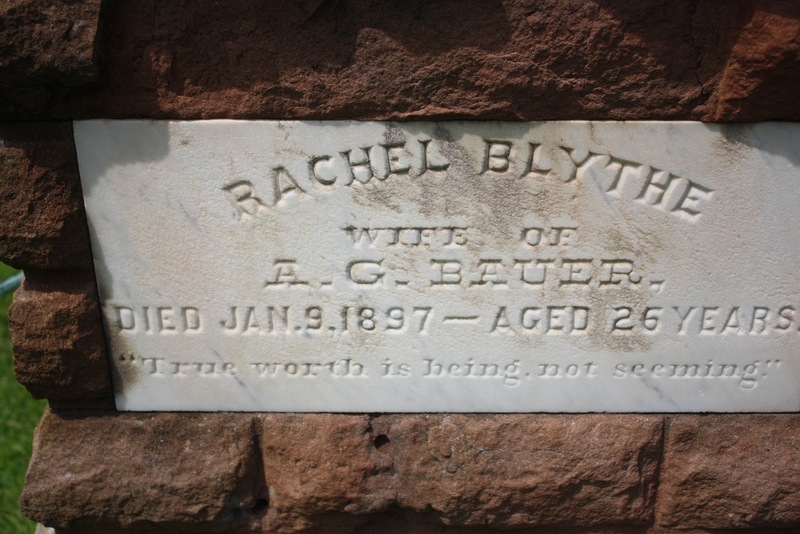 As a young adult Rachel studied stenography at the Baptist Institute and worked at Raleigh’s Post Office as a stamp clerk.5 She would later meet Adolphus Gustavus Bauer, who is buried at her side. 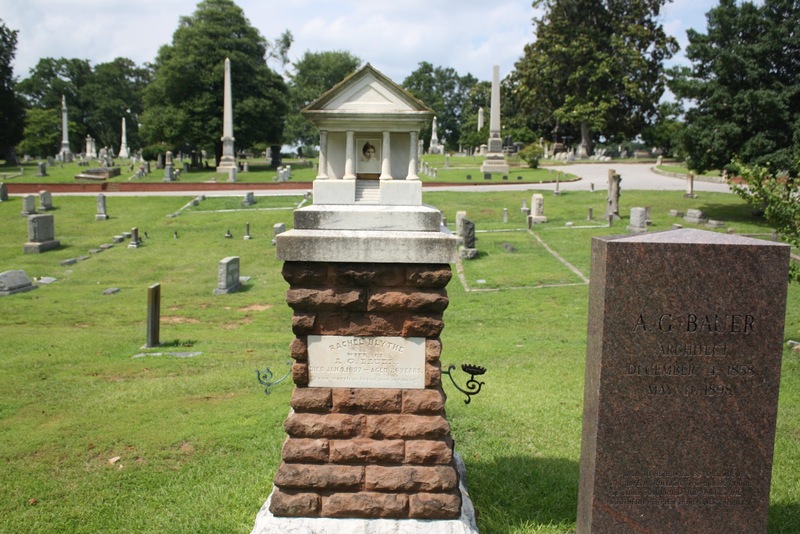 Adolphus was born in 1858 in Martinsburg, West Virginia to German-born parents, Frederick and Sophia Bauer. 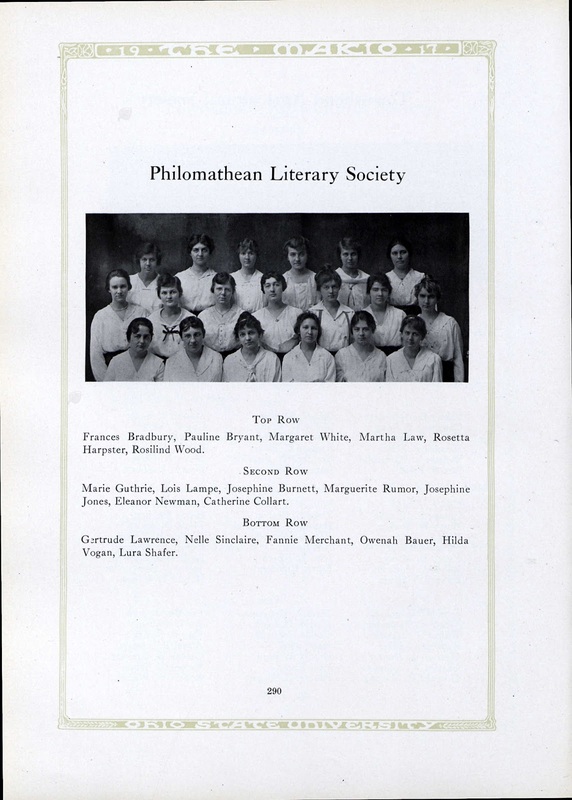 Adolphus was educated at Bethany College in West Virginia and then went to Pennsylvania where he attended Iron City Business College and the Philadelphia Academy of Fine Arts.4 Some sources indicate he also studied painting in Cinncinnati. 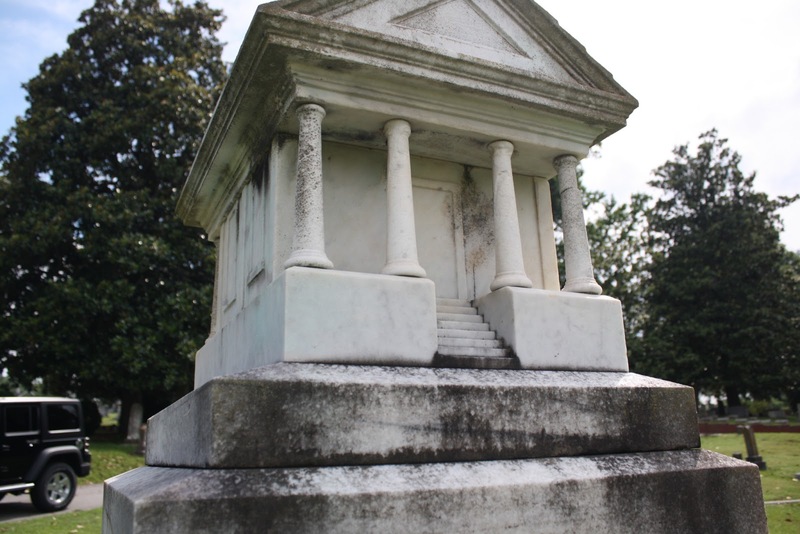 In 1881 Adolphus was hired as a draftsman for architect Samuel Sloan and in that capacity he traveled to North Carolina to assist with some of Sloan’s projects in the South. After Sloan’s death in 1884, Bauer continued to work on various NC projects, such as Raleigh’s Executive Mansion, Chapel Hill’s Memorial Hall, and Morganton’s Western North Carolina Hospital for the Insane.4 Bauer left North Carolina in 1887 but returned in 1891 to work on other architectural endeavors, incorporating the Queen Anne style into his designs. Adolphus and Rachel were boarders at the same house, which is where they met and fell in love. 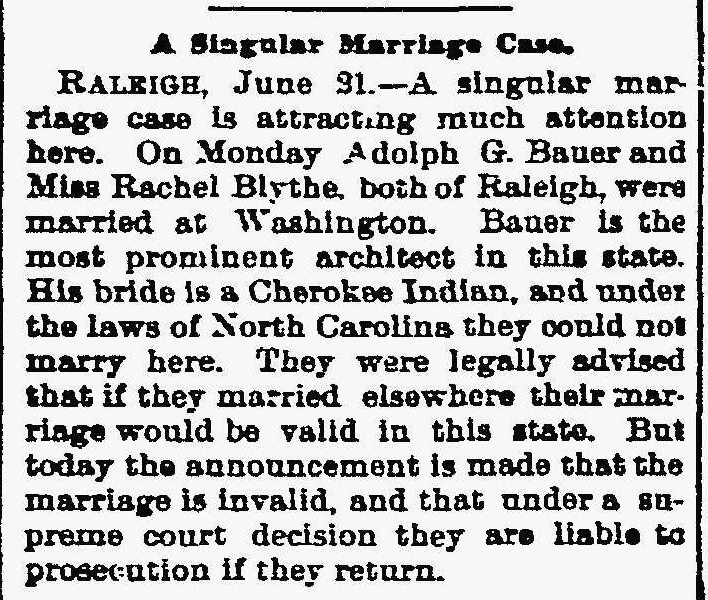 They had a secret ceremony in 1894 but wanted to make their nuptials official after Rachel became pregnant. 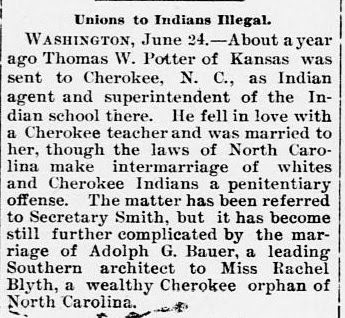 Because marriages between Native Americans and people of other races were illegal in North Carolina, the couple went to Washington for their second wedding in June 1895 under the assumption that the marriage would still be valid in North Carolina. That validity would be debated, but regardless of legality the couple would never be fully accepted with open arms into the community. 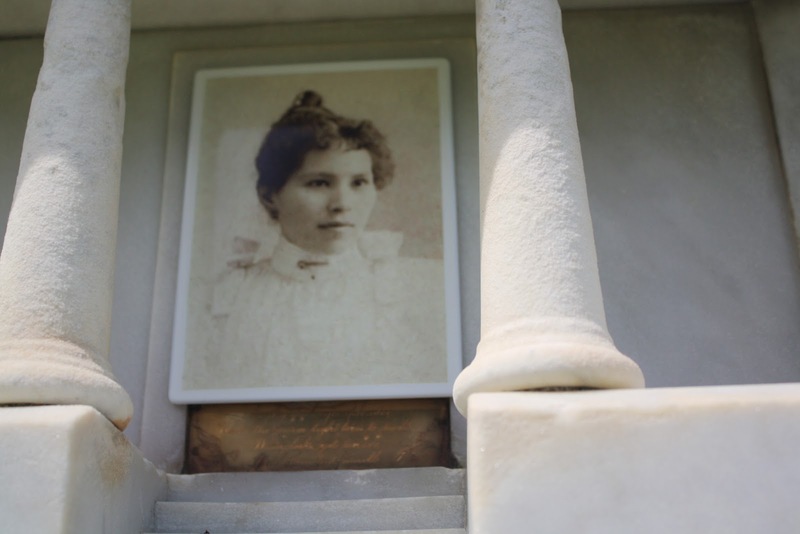 In October 1895 the couple’s first child, Owenah was born. 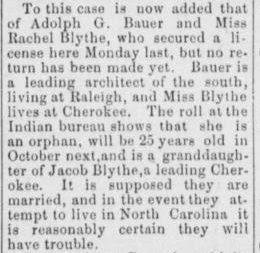 Despite the possible isolation and discrimination that the Bauers faced they remained in North Carolina where Adolphus’ career flourished. That changed on May 2, 1896 when he and contractor Charles Norton were in a carriage hit by a train at a crossing in Durham. Adolphus’ brain injuries would leave lasting physical and mental issues, including dizzy spells, delusions, and melancholia. He was hospitalized at Raleigh’s North Carolina Hospital for the Insane at least once. After his institutionalization he suffered from the same complications but attempted to work even though he had great trouble concentrating on projects. 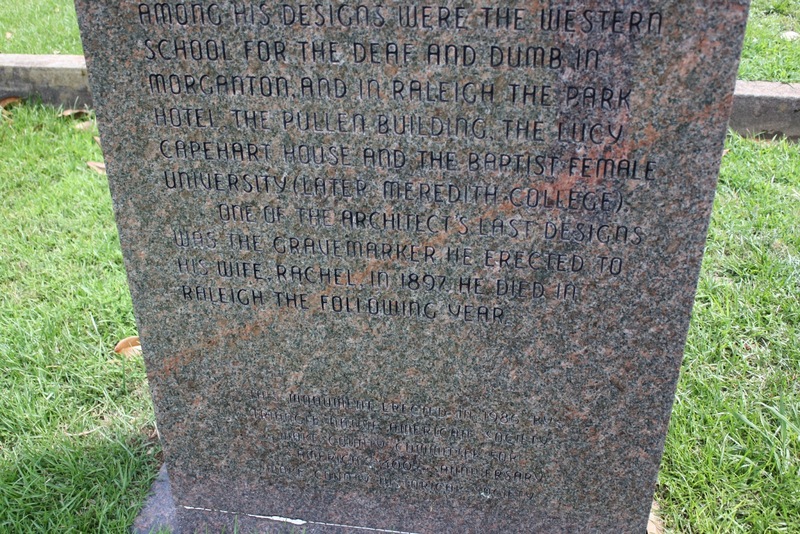 A letter written to his sister revealed that his reputation as an architect had been marred by the accident’s effects and he even questioned his own capabilities despite his local reputation. A lawsuit against the railroad was filed, but the process was slow and it didn’t seem like the Bauers would receive any compensation. The couple’s second child, Fred Blythe Bauer, was born on December 27, 1896. 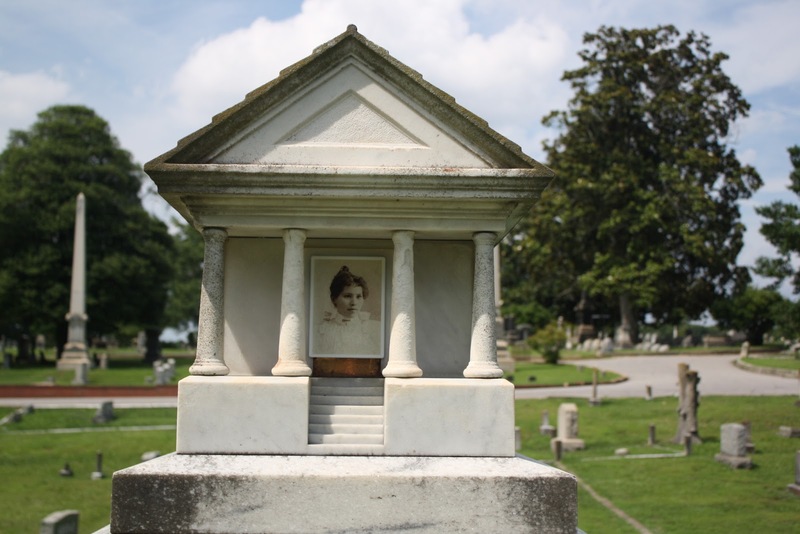 Rachel had been ill throughout the fall and winter and died within two weeks of Fred’s birth on January 9, 1897. Unable to care for the children, Adolphus sent the children to live with relatives. 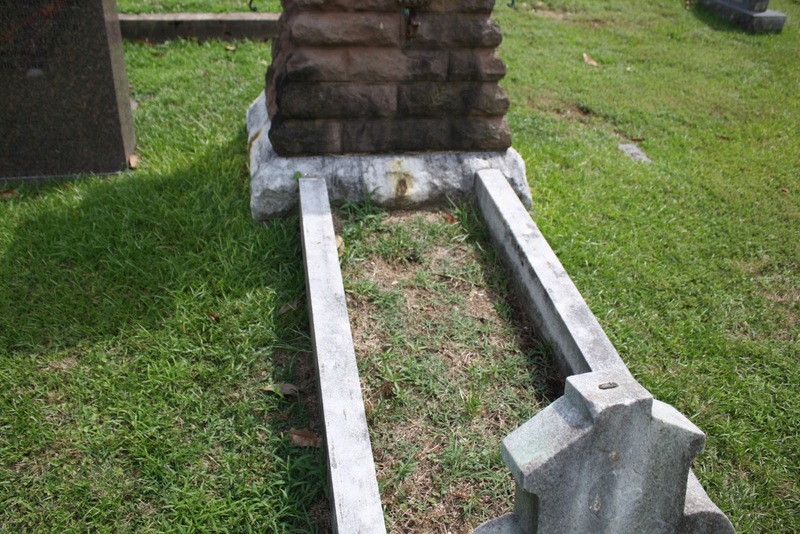 Fred went to Qualla Boundary, where he was adopted by Rachel’s brother James and his wife, Josephine. Owenah ended up in Ohio with Adolphus’ family. 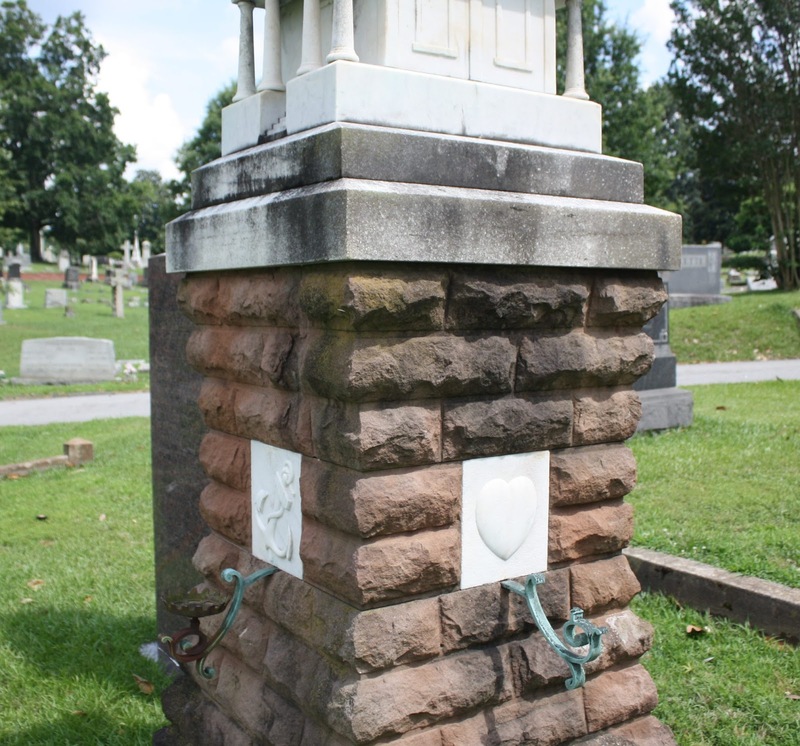 Lamp-holders are set underneath designs around the column. 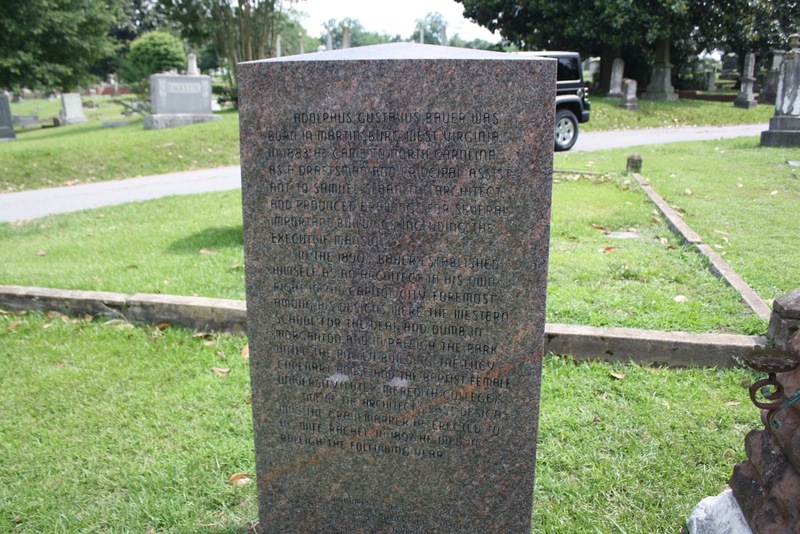 In my haste, I didn’t take a good photo of the front of Adolphus’ marker, but in the following picture you can see that some of the inscription is from his suicide letter. 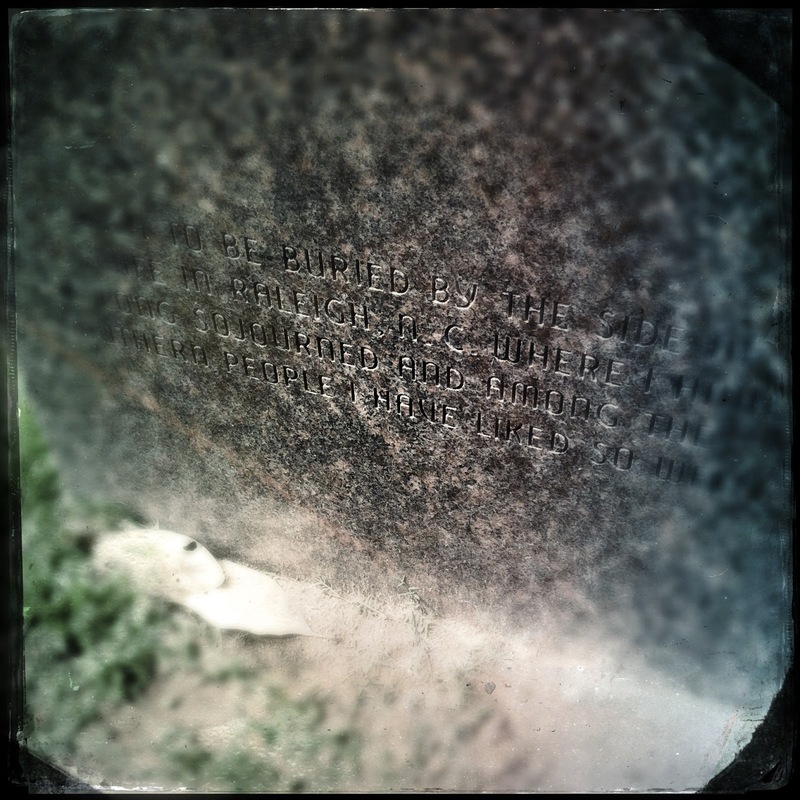 The words, “I wish to say that if I, by violence to myself should die” were omitted. Both Owenah and Fred, despite the rocky start they had in life, survived into their seventies and had families of their own. Fred died in 1971 in North Carolina and Owenah in Ohio in 1974. Unfortunately it seems as though many of the buildings designed by Bauer have been razed over time, even though some still stand today. Fascinating post! It's interesting, although sad, to read about these people. I'm glad you were able to include so much information about them, and about the attitudes of the time (to give some perspective).